Today, I am going to tell you the story of how I bought my dream car (my first new car) when I was 24. Purchasing the new car was a mistake on its own but its not something I entirely regret. 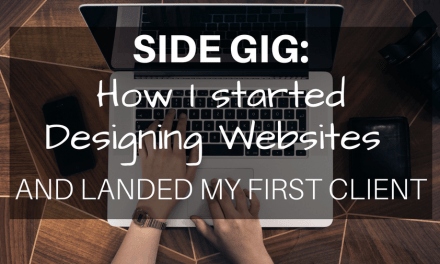 I feel like I learned a lot from the experience and was able to help others including my girlfriend in making an informed decision of their own. 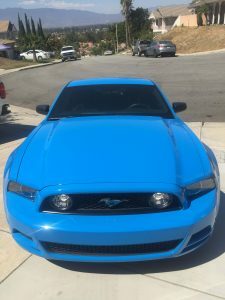 There were 3 big mistakes I made that led me to owning a brand new 2014 Grabber Blue Mustang. These mistakes were an important lesson in my life that helped me think better financially and more responsibly. Its also a reminder and a good case of learning from my mistakes. My first car was a 2000 Chevy Impala that my parents bought for me while I was a high school senior. They got a great deal on the car since it belonged to one of my grandpas customers and it was not running due to a bad fuel pump. My dad and I replaced the fuel pump for under $100 and the car was up and running. I drove the car to school every day and when I graduated, I drove to and from work and college every day also. I was doing quite a bit of driving every single day. In the 4 years I owned the car, I remember only doing 4 oil changes and no services or tune ups other than one mechanic visit when the AC stopped working. After the 4 year mark, the car developed a strange problem where it would start overheating whenever it was stopped in traffic or at a light for more 1 minute or so. It was strange, the car would drive fine but as soon as I hit a stop light or got stuck in traffic, the temperature needle would start increasing. As soon as I took off, it would cool back down. I’d always thought this sort of problems would be the other way around. The car was starting to show its age in the condition of the interior and a lot of other components. I was afraid the car would leave me stranded on the road someday so I started looking for another car. 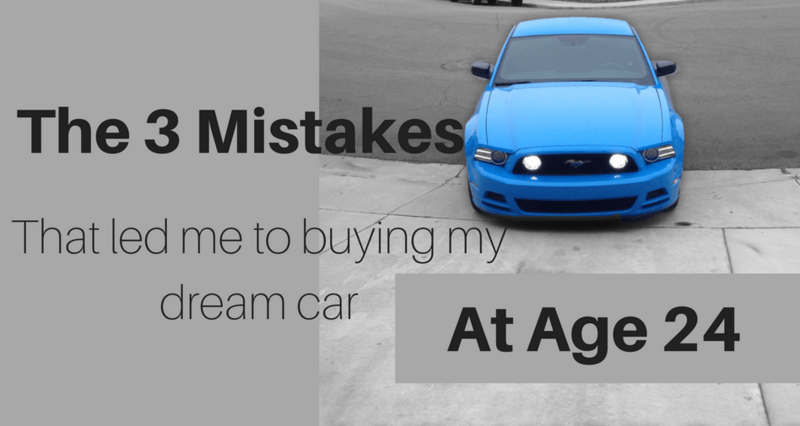 The second mistake I made was purchasing a used 12 year old (at the time) BMW 3 series off Craigslist. I had been working full time now for about 4 years now and I had some money saved in the bank so I decided that I was finally going to take the plunge and buy my first car. I didn’t even consider looking at cars from a dealer and decided to buy the car cash off the street. Looking back now, in a series of plenty of mistakes this was actually one of my smarter decisions. At the time I was 21 and wasn’t even sure what I wanted in a car. I did NO research whatsoever and just starting browsing Craigslist for pretty much every brand of cars. I knew I wanted something hip, edgy, something cool. I bought a used 2000 BMW 328i. 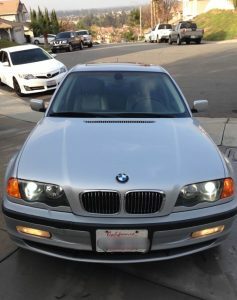 It took me only a couple of days of browsing though Craigslist before I landed on an ad for a Silver 2000 BMW 328i. The car looked really nice in the pictures and the seller was very responsive to my texts. I test it drove the car with my dad and I asked him for his opinion. He told me that it looked to be in good shape and running well. He warned me about the price for repairs on European cars but ultimately told me the decision was mine. $5,800 later, the car was mine. From the start I found several things wrong with the car that I didn’t notice on the test drive and the previous owner did not mention. I started Googling some of these issues and found I wasn’t the only one with these problems. Thankfully there are a lot of BMW forums online with tutorials and DIY for a lot of the common issues with this car. Little by little, I started ordering parts online, watching Youtube videos, following tutorials, and I started fixing some of these problems myself. This was an uphill battle since every time I fixed something, two more issues would pop up. The car ALWAYS had something wrong with it. It was usually little things that were not big enough to be dangerous or leave me stranded but noticeable enough to be annoying. Eventually I gave up on trying to fix all the small electronics problems that would pop up and just drove it that way. I had the car for a year and a half before it left me stranded twice in one month. The second time it broke down, I was only a mile away from home on a Saturday night and my dad towed me instead of calling a tow truck. He was upset about all the car problems I was having lately and told me to just buy a new car. We talked it over and we agreed that we would go the very next day to buy one. A simple lesson to learn for future car purchases, if I had done some research online before purchasing it, I could of found all the common and potential problems for this car. Side note: If nothing else, The BMW did get me interested in working on my own car instead of taking it to a shop. I never took it to a mechanic and did all the services and oil changes myself. If you follow the online guides and videos its pretty straightforward. I never had a car payment but literally everyone I knew had one. After my dad towed me back home, I gave it some thought and decided that I would buy a new car. I already knew what car I wanted. It was the car I had wanted ever since the 2005 model came out. The car was actually not too expensive and was comparably priced to any mid-size sedan such as an Accord or like my brothers new Camry. I started searching for local Ford dealers that might have a brand new 2014 Mustang in stock. Since I was going to buy the car new and it was the same price, I decided to get a very rare color that Ford makes: Grabber Blue. I found the car online at a Ford dealer in Hollywood. My dad and I made the 1 hour trip. We went through the car lineup but did not see the one I wanted. We asked one of the salesman for the car and they directed us to a back lot where it was in storage. I test drove it and 2 hours later I was on my way back home in my brand new Mustang. And just like that, I now had a $400 monthly payment! I gave no down payment and got a great rate on the financing since my dad co-signed with me. The car’s total cost: $27,500 with taxes, fees and financing. After about a year or so, I started thinking I should of waited and maybe purchased something else. Maybe a newly redesigned 2015 Mustang. Don’t get me wrong. I loved driving the car. It was surprisingly comfortable, fast, loud and got everybody’s attention. Everything a 24 year old could want right? However, its interior was very outdated. The car was very standard and basic. No equipment whatsoever. Even my brothers 2014 Camry had Bluetooth, a rear view camera, paddle shifters, and a center console screen. This is on a car that was the same year as mine and very similarly priced. I did end up installing a rear view camera and a makeshift ghetto Bluetooth adapter to connect my phone. 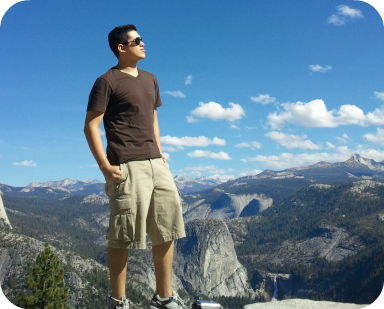 If I could go back, I would of taken some time to think about the decision. A $27k purchase is not something to decide overnight. So there you go. 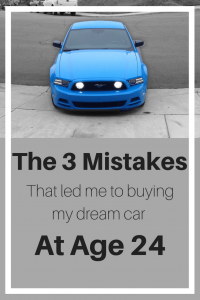 The 3 big mistakes that I made which led me to buy my dream car. While I loved driving the car, it wasn’t practical, and after about 2 1/2 years, I started to look for ways to get rid of it and a car payment all together. If I could go back, I would of done some research and purchased a used reliable car, in cash after my old BMW broke down. These were tough valuable lessons that I just had to learn the hard way. Having a monthly car payment was a big wake up call for how much money I was saving at the time and how much I could now save. Next to my credit card debt (which I started to pile up shortly after I bought the car), this whole car drama was definitely the biggest reason I created a budget and started keeping a close eye on my finances. My bank account had been steadily going up every month. 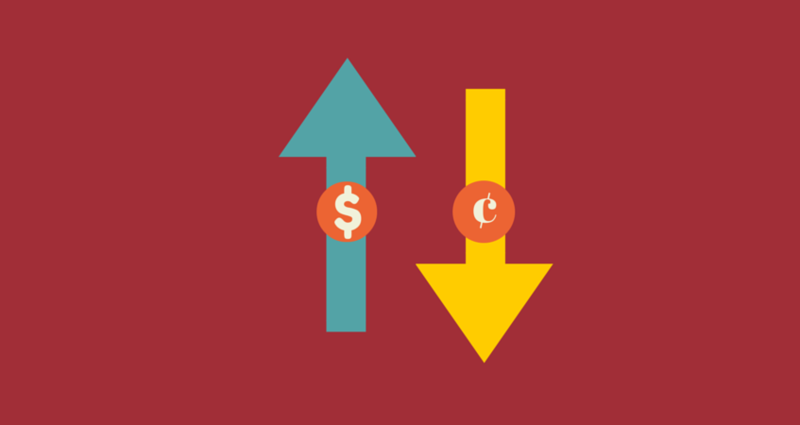 After I bought the car, it flat lined and for a while even started to go down before I started thinking of creative ways to save money and automate my savings. There is a lot of lessons I hope you can take away from this post but the most important thing I can tell ya is to take your time. This post is not meant discourage anybody from buying a new car or their dream car. We all have different needs and scenarios and for some people, a car payment maybe the only option. I get that. Google is your best friend. Whatever car you might be thinking about buying, Google search its common problems, reliability, complaints, and consumer reviews. If its a new car, look at the history of past models. There are tons of forums, review sites and even Reddit. If you’re going to drop down $25k—$30k, the least you can do is your due diligence. Sleep on it. Ask you friends, family or even co-workers about their opinion. 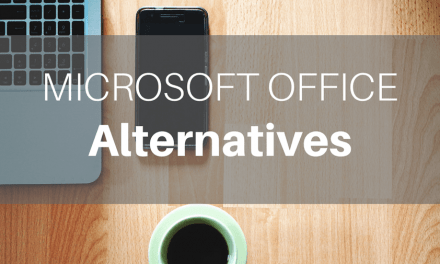 Take your time to do your research, get better financing options, etc. If you’re buying a used car, make a list of candidates, pros and cons, budget etc. If you need a car to get around ASAP, I would actually encourage you to take a week to do your research and get around by other means. 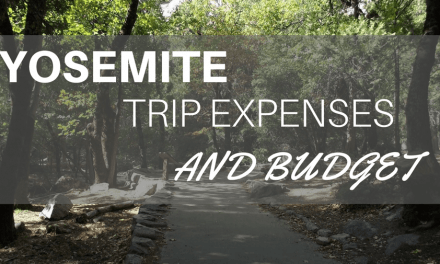 You could Uber, take the bus, ask for a ride, or even rent a car for the week. The price of a car rental for a week is nothing compared to regretting your purchase for the next 6 years. Do you have any car purchase tips or regrets? I’d love to hear your stories in the comments.